Call, R.E. 1895. A study of the Unionidae of Arkansas, with incidental reference to their distribution in the Mississippi valley. Transactions of the Academy of Science of St. Louis 7: 1-64. Call, 1895, Trans. Acad. Sci. St. Louis: 60. Simpson, 1900, Proc. U.S. Nat. Mus. : 617. Simpson, 1914, Descr. Cat. Naiades: 347. Williams et al., 2008, Freshw. Mussels AL and Mobile Basin: 709. Watters et al., 2009, Freshw. Mussels OH: 294. ‘Gould’ Call, 1895, Trans. Acad. Sci. St. Louis: 63. Lea, 1870, Synopsis Fam. Naiades: 81. Clessin, 1873, Conchyl. Cab. : 243, pl. 17, figs. 5-7. B.H. Wright, 1888, Check List: unnumbered p. 7. Utterback, 1916, Amer. Midl. Nat. : 311. Frierson, 1927, Check List N. Amer. Naiades: 23. Call, 1887, Proc. U.S. Nat. Mus. : 499, pl. 28. Call, 1895, Trans. Acad. Sci. St. Louis: 6, pl. 17. Type(s): LECTOTYPE MCZ_5020, Jacks Fork, Currant River, Shannon Co., Mo. ‘Lea’ Call, 1895, Trans. Acad. Sci. St. Louis: 20. Call, 1887, Proc. U.S. Nat. Mus. : 498, pl. 27. Call, 1895, Trans. Acad. Sci. St. Louis: 33, pl. 18. 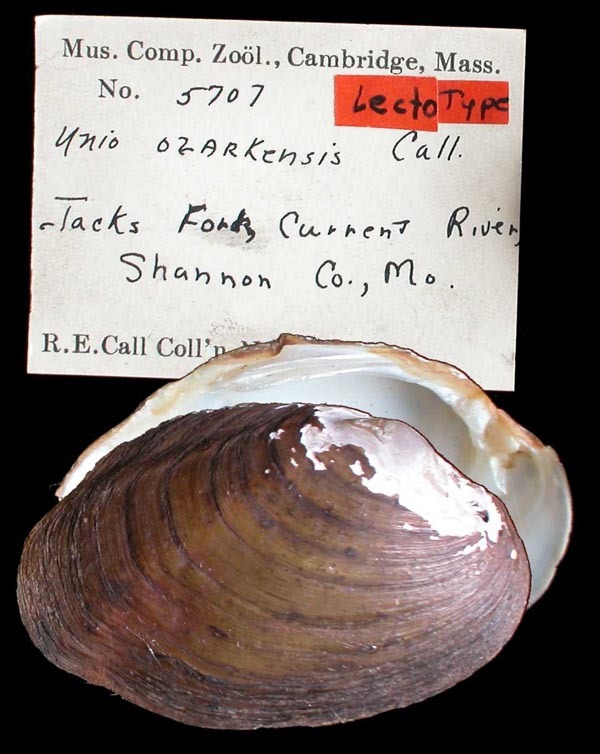 Type(s): LECTOTYPE MCZ_5707 (selected by R.I. Johnson, 1975), Jacks Fork, Current River, Shannon Co., Mo. ‘Lea’ Call, 1895, Trans. Acad. Sci. St. Louis: 42, pl. 15, figs. 3-4. Anodonta edentula Say, 1829. — Call (1895: 59). Anodonta grandis Say, 1829. — Call (1895: 61). Anodonta imbecillis Say, 1829. — Call (1895: 63). Anodonta opaca Lea. — Call (1895: 64). Margaritana complanata Barnes. — Call (1895: 58). Margaritana confragosa Say, 1829. — Call (1895: 59). Margaritana rugosa Barnes. — Call (1895: 59). Unio aberti Conrad, 1850. — Call (1895: 4). Unio alatus Say, 1816. — Call (1895: 5). Unio anodontoides Lea, 1830. — Call (1895: 6). Unio arkansasensis Lea. — Call (1895: 6). Unio breviculus Call, 1887. — Call (1895: 6). Unio caliginosus Lea, 1845. — Call (1895: 8). Unio camelus Lea, 1834. — Call (1895: 35). Unio capax Green, 1832. — Call (1895: 8). Unio castaneus Lea, 1830. — Call (1895: 8). Unio cerinus Conrad, 1838. — Call (1895: 9). Unio clavus Lamarck. — Call (1895: 9). Unio cornutus Barnes, 1823. — Call (1895: 12). Unio crassidens Lamarck. — Call (1895: 12). Unio cuneus Conrad, 1836. — Call (1895: 14). Unio cylindricus Say, 1816. — Call (1895: 15). Unio donaciformis Lea, 1827. — Call (1895: 15). Unio ebenus Lea, 1830. — Call (1895: 16). Unio elegans Lea, 1830. — Call (1895: 16). 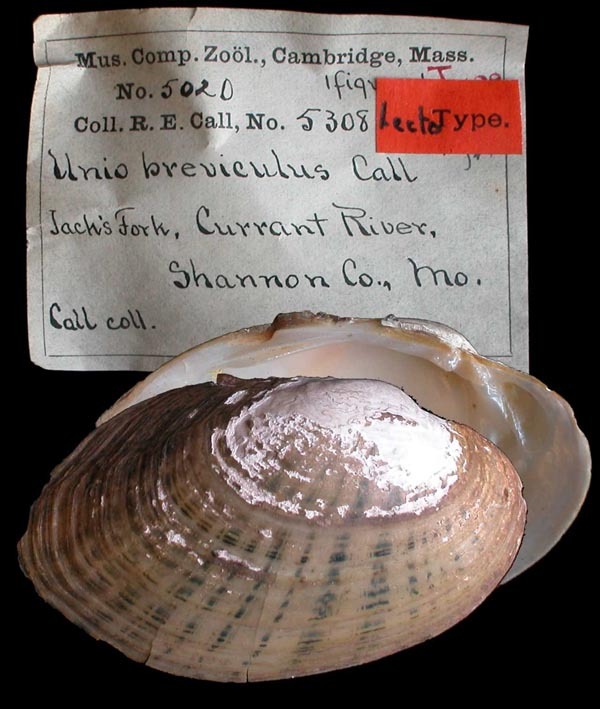 Unio gibbosus Barnes, 1823. — Call (1895: 17). Unio glans Lea, 1830. — Call (1895: 18). Unio gracilis Barnes, 1823. — Call (1895: 19). Unio grandidens Lea, 1862. — Call (1895: 19). Unio irroratus Lea, 1827. — Call (1895: 20). Unio lachrymosus [sic] Lea, 1827. — Call (1895: 21). Unio ligamentinus Lamarck. — Call (1895: 22). Unio luteolus Lamarck. — Call (1895: 25). Unio lævissimus Lea. — Call (1895: 21). Unio metanevrus Rafinesque. — Call (1895: 28). Unio multiplicatus Lea, 1830-31. — Call (1895: 29). Unio obliquus Lamarck. — Call (1895: 31). Unio occidentalis Conrad, 1836. — Call (1895: 33). Unio ozarkensis Call, 1887. — Call (1895: 33). Unio parvus Barnes, 1823. — Call (1895: 34). Unio phaseolus Hildreth, 1828. — Call (1895: 35). Unio planulatus Lea, 1829. — Call (1895: 35). Unio plenus Lea, 1840. — Call (1895: 36). Unio plicatus Lesueur. — Call (1895: 36). Unio purpuratus Lamarck. — Call (1895: 38). Unio pustulatus Lea, 1830. — Call (1895: 40). Unio pustulosus Lea, 1830. — Call (1895: 40). Unio rectus Lamarck, 1819. — Call (1895: 43). Unio retusus Lamarck, 1819. — Call (1895: 45). Unio rotundatus Lamarck, 1819. — Call (1895: 47). Unio securis Lea, 1829. — Call (1895: 50). Unio speciosus Lea. — Call (1895: 50). Unio subgibbosus Lea, 1858. — Call (1895: 50). Unio subrostratus Say, 1831. — Call (1895: 51). Unio tetralasmus Say, 1830. — Call (1895: 52). Unio trapezoides Lea. — Call (1895: 54). Unio trigonus Lea, 1831. — Call (1895: 54). 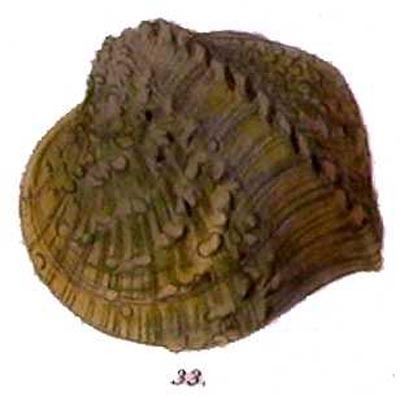 Unio tuberculatus Barnes, 1823. — Call (1895: 55). Unio tumescens Lea, 1845. — Call (1895: 55). Unio undulatus Barnes, 1823. — Call (1895: 56). Unio ventricosus Barnes, 1823. — Call (1895: 57). Unio venustus Lea, 1834. — Call (1895: 57).